Summer Chorus of RI and SE Mass. Tiverton and Bristol, R.I.; Fall River, Mass. Our new music director is Frank Wilhelm and Nicholas Rocha will be our accompanist! We will rehearse on Mondays at 7 PM as usual starting on June 4th. 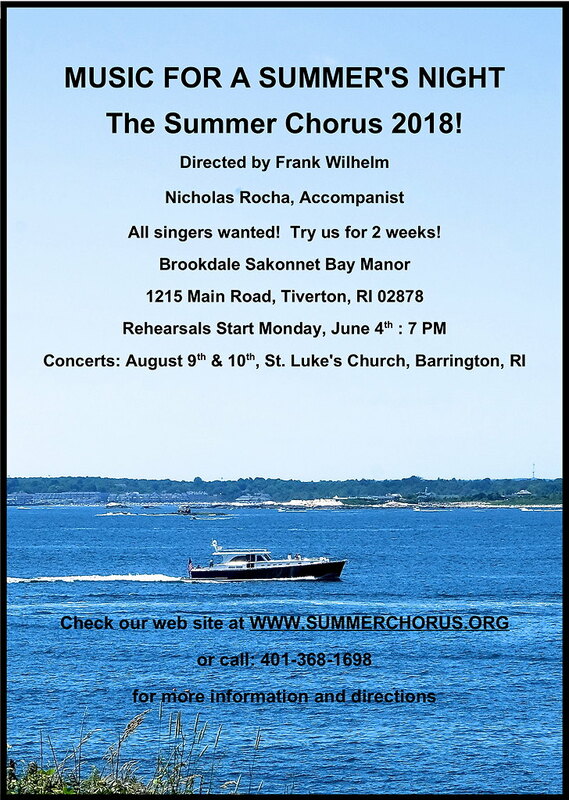 All rehearsals at the Sakonnet Bay Manor at 1215 Main Road in Tiverton, RI. All singers are welcome – no audition required. We will do our dress rehearsal for the residents at Brookdale on Wednesday, August 8th, and perform at St. Luke’s in Barrington on Thursday and Friday, August 9th and 10th. The fee is $60 which includes all music. You may try up to two rehearsals before you pay the fee. Most of all it is FUN!